It brings me a certain level of pain to feel forced to throw up a post about basketball that isn’t about the NBA Finals. I want to write about the fact that all of the sports pundits who are so reluctant to give Miami any credit for the run they are on are completely in denial. Yes, Miami’s defense is that good. Yes, they have learned to play well together. Yes, their supporting cast is not as bad as we all thought it was now that all of the players that were supposed to play are finally on the court together when it matters. Yes, Dallas is not that much better of an offensive team or team in general. Please just give Miami credit, despite your inclination to be angry at surface appearances rather than to completely understand the entire experiment. I’m tired of short sighted declarative remarks on who the Miami Heat are. Let’s think about the narrative of basketball in general, of people in general and of where we are not only in the history of the NBA, but as a society in relation to our heroes, our values and what we deem as virtues. 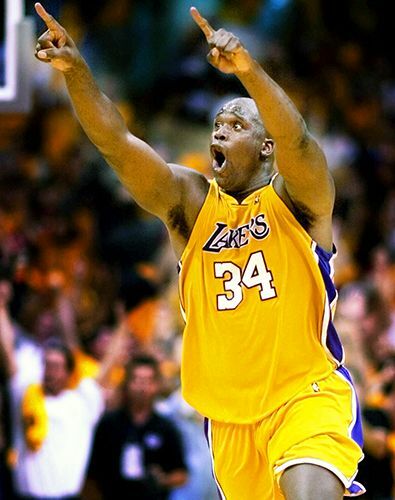 However, I have to write about Shaquille O’Neal because we will probably never see him play basketball again. In 1993, I was backstage at a talent show (yes, talent show) at my elementary school, Pearl S. Buck Elementary. I was going to be lip synching the words to the “Fresh Prince of Bel Air” and doing an early 90’s dance routine with two friends of mine (I was seven years old and it was the angular, neon, early 90’s). I was just beginning to learn about and understand basketball. Hell, I was just a few weeks removed from my first two great basketball experiences (watching the 1993 East Regional Sweet Sixteen live and then the 1993 NCAA Championship late at night) and a few weeks away from one of the most formative basketball experiences of my life (watching Game 3 of the 1993 NBA Finals when the Suns beat the Bulls in triple overtime 129-121). We were backstage at the show and kids were talking about someone named “Shack.” I imagined who this player was that they were referring to. I didn’t watch basketball as religiously as I do now and the Orlando Magic weren’t in the 1993 Playoffs. 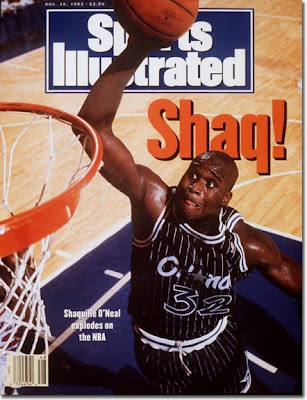 I only found out about Shaq, Shaquille O’Neal, at the 1993 Draft when a player named Penny Hardaway was traded by the Golden State Warriors to the Orlando Magic for Chris Webber. The announcers were baffled because a teaming of Webber and “Shaq” (as it was actually spelled) seemed unstoppable. They showed clips of Webber on the Fab Five Michigan team, which I was familiar with. Then, they showed clips of Shaq. I don’t think I had seen anyone jump as high as Shaq. Not Shawn Kemp, not Michael Jordan, not anyone. He jumped with a different force; he broke backboards. That summer, I lowered my net and started practicing my dunks. I was seven years old and my hands hurt when I grabbed the rim. As the 1990’s continued and I grew into my consciousness as an active person and as a basketball fan, I pledged allegiance to Jordan. There was just something right about him. His movements were so smooth, the angles and places he got to were unreal, there was just an element of inevitability about Michael Jordan—he was the hero and he was always going to win. It’s only later in life that I understand the toll that took on him personally as well as on those around him, but then, it just seemed right. Michael Jordan was the best player. 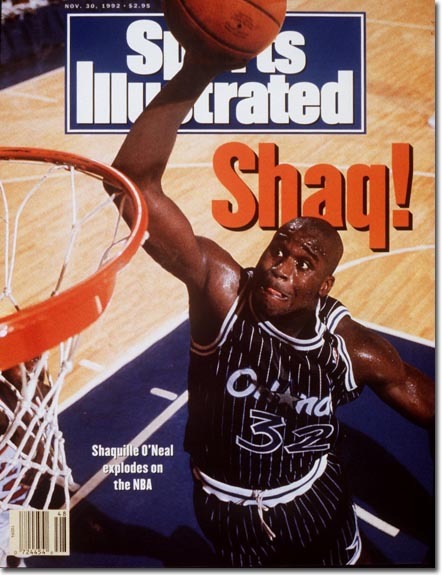 When Shaq and the Orlando Magic unceremoniously dumped Jordan and the Bulls from the 1995 Playoffs, I was furious. I watched as Shaq and Penny victoriously carried a vindicated Horace Grant off the court on their shoulders. And I was more than pleased a year later when the Bulls swept the Magic in the Eastern Conference Finals, effectively ending the Orlando Magic’s “Penny and Shaq era” as Shaq moved west to the Los Angeles Lakers. Jordan retired. The league went on strike. Tim Duncan won a championship, but Shaq was the best player. He was to be the new face of the league. Then, a young Kobe Bryant joined him and things started to happen. Shaq had always been a force of nature—a huge and imposing physical specimen, who nonetheless had a playful and goofy demeanor (see Kazaam!). However, in 1999-2000, Shaq became the immovable object. Shaq took on that air of inevitability. You fed Shaq the ball and he either got to the rim for a dunk, an easy layup, the baby hook or he passed it out to an open man or he was fouled. Shaq was fouled a lot. They invented the “Hack-a-Shaq” for God’s sake, which was one of the worst developments in basketball. I’ll remember the “Hack-a-Shaq”—it is an unfortunate part of his legacy—but I’ll mostly remember the dominance, the inevitability you felt when you watched Shaq. I hated the Lakers during their dominant run from 1999-2004. I hated Shaq, I hated Kobe, I hated Rick Fox and everyone else. They were a great team, though, and Shaq was phenomenal. However, from my perspective, it seems like there should have been more. I know that is unfair to say and I don’t know why I’m saying it about a player I never liked, but simply marveled at and acknowledged his greatness. When Jordan entered that realm of inevitability he seemed to revel in it, it seemed to permeate everything about him, whereas with Shaq it never did. With Shaq, he seemed to see his own inevitability, he saw the shape and knew it for what it was and decided that it wasn’t for him. So, perhaps that makes him better in a way than Jordan, perhaps the psychological and spiritual damage is less. After all, Shaq is known for his off the court penchant for solving crimes as a volunteer police officer, for his playful antics, his sense of humor and his charity. And that all comes with being a basketball player and a larger than life figure. Shaq was always comfortable in his skin as a big man, which is a proven rarity (see Kareem Abdul Jabaar to this day), and he was perhaps comfortable with not realizing his total potential as a basketball player. He went through seasons out of shape, he pouted about fame and his importance. He left feuds and a bad taste in his wake (see Penny Hardaway, Kobe Bryant, Dwyane Wade and even Steve Nash). There was a convincing essay by the FreeDarko guys that made a very convincing claim that perhaps Shaq was never the person we imagined him to be—perhaps it was all an act, by someone who was maybe more insecure than we imagined. And yet, he won four titles, the 2000 MVP Award, 3 Finals MVP Awards and other accolades. He was a star beyond stars. He was a rock. He was there year after year. He was Shaq and he was inevitable. This past year in Boston you knew it was the end of the line. Shaq stayed away from the spotlight other than his good-natured antics with the citizens of Boston. He stressed the importance of taking less money to play for a winning team, something he never said before. He was not a force of nature, but rather someone you were hoping could give you ten points and five rebounds a night. The only inevitability about Shaq was that he would be injured. So, I’m glad he retired. He was a phenomenal player that I will never forget. He is certainly one of the top five centers or “big men” of all-time. We may never see a player play Shaq’s type of physical, forceful post game again (Dwight Howard is a long shot to even come close) and that makes me sad. Yet, I still feel like he left something behind. I still remind the periods of Fat Shaq, the player who somewhat took his own inevitability for granted. Maybe, like I said, he knew what it was and didn’t want it, maybe it was a conscious decision. And I know you’re not supposed to compare a player to another player, especially not to Jordan. But there is something about embracing that rare trait of inevitability that is appealing to me, that seems honorable, no matter what the damage may be. Maybe I’m wrong. Maybe Shaq is right. I’m not sure that we’ll ever know for sure and maybe that’s just one of the ways that people are different. In any event, thank you Shaq for having left your mark. Thank you for making the history of the NBA that much richer. I’ll be seeing you shortly on TV somewhere.